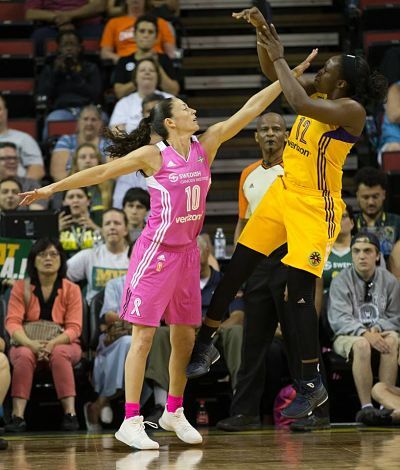 Sue Bird gets a hand in front of Chelsea Gray’s face. Photo by Neil Enns/Storm Photos. 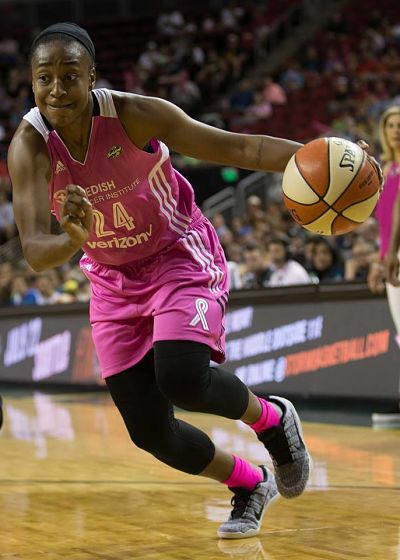 Seattle – The Seattle Storm scored 81 points on Saturday night against Los Angeles. The starting lineup for the Storm had all 81 of them. 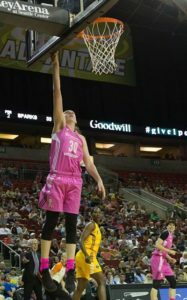 Led by 26 from Breanna Stewart, and 22 from Jewell Loyd, Seattle rebounded from a home loss to New York on Thursday with a 81-69 win over the Sparks at KeyArena. 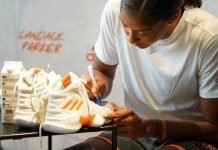 Nneka Ogwumike had 21 points to lead Los Angeles, as one of four players in double-figures (10 each from Candace Parker, Jantel Lavender, and Riquna Williams). Despite no points off the bench, Seattle finished the night having shot over 50 percent from the field, going 8-from-15 from three-point range. Early on, it was Los Angeles (12-5) that set the tempo. Jewell Loyd drives along the baseline. Photo by Neil Enns/Storm Photos. Ogwumike had 10 of her team’s first 14 points, while all five Seattle starters had scored by the first official timeout of the night. A 10-2 Los Angeles run to the end of the quarter gave the Sparks a six-point edge after 10 minutes. L.A. pushed that lead to 10 early in the second, before the Storm (8-9) answered with a 13-0 run of its own. The Sparks took a 39-37 advantage into the break — paced by Ogwumike’s 14 — while Bird, Stewart, and Loyd were all in double-figures for Seattle. The back-to-back Rookies of the Year would combine for 19 in the third as the Storm took a 60-50 lead with less than a minute to go, but a jumper by Alana Beard, and a three-pointer from Lavender after a technical foul on Stewart cut that deficit in half by the quarter horn. But the Storm kept Los Angeles from getting any closer. The Sparks were held to just 14 points in the final period, with Seattle holding a double-digit lead for much of the waning moments. The Storm went 8-of-9 from the free-throw line in the fourth to seal the result. And after those 10 early points from Ogwumike, Seattle held the reigning MVP to just 11 more over the next three-plus quarters. 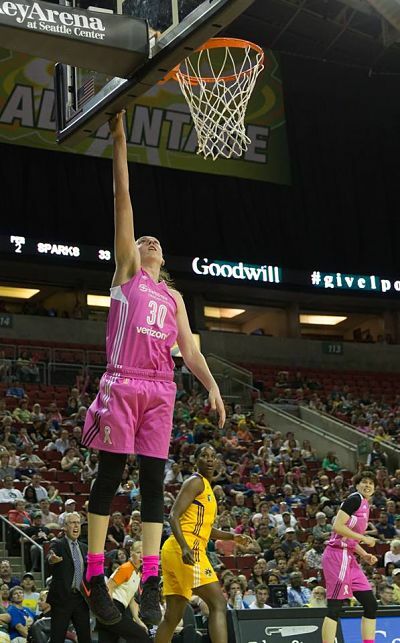 Breanna Stewart gets the wide-open layup. Stewart lead all scorers with 26 points. Photo by Neil Enns/Storm Photos. “I think we just focused in a little bit more on defense, and were rotating to her even more than we were,” Stewart said. The Seattle defense also held Los Angeles to just 30 second-half points, tied for the Sparks’ worst scoring half of the season, while 69 points for the game was also a season-low. 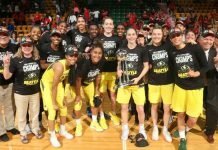 For Sue Bird, who finished with 15 points on 6-of-7 shooting, her team played the way it needed to, regardless of the end result. And for a Storm team that has lost five games by eight points or less, the win is also a welcome result after several recent late-game miscues. Seattle continues its five-game homestand with its annual ‘Kids Day’ noon tip-off on Wednesday against Connecticut, while the Sparks return home for three dates at the Staples Center prior to the All-Star break, starting with the Sun on Thursday night. The season series is now tied at a game apiece. Los Angeles won the first matchup in both team’s season-opener on May 13 at the Staples Center, 78-68. The two sides meet for the final time in the regular season on July 25 in L.A.
Kaleena Mosqueda-Lewis was listed as questionable, missing the last 12 games after undergoing a right knee scope, but did not play. Carolyn Swords did not appear for the for the second time in the last three games, along with Alexis Peterson and Lanay Montgomery. Jenny Boucek is now 5-0 against the Sparks at KeyArena since becoming head coach of the Storm, replacing none other than current L.A. head coach Brian Agler. 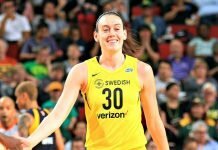 Breanna Stewart has scored at least 20 points in each of the last four games.